Philippines: "The typhoon was a disaster, but this hospital is a blessing"
Ten-year-old Ayron Sanchez was the first child to undergo surgery in the inflatable operating theatre set up by Médecins Sans Frontières/Doctors Without Borders (MSF) in Guiuan in the aftermath of Typhoon Haiyan. “When Ayron was a little boy of three, he fell from a bridge and his leg got stuck between some wooden planks,” says Ruby Sanchez Abendaño, Ayron’s aunt. “Ever since then he has had problems with his left leg,” she says. Ruby sits outside the inflatable operating theatre tent with Ayron's father, a shy rickshaw driver, who is nervously waiting for his son to come out of surgery. While they wait, 43-year-old Ruby tells her nephew’s story. “We were always worried he would lose his leg,” she remembers. When Ayron was five, his left thigh started to swell. His parents travelled with him to Mindoro to see an orthopaedic doctor. “The doctor advised amputation,” says Ruby, “but Ayron’s parents couldn’t afford it, so they went back home.” After some time, Ayron’s leg became infected and developed abscesses. Ayron was unable to walk, so his father used to carry the boy around on his back. “Then the typhoon came and destroyed our houses,” says Ruby. The two families, who lived next to door to each other in a small town on the coast of Samar island, sought shelter in a neighbour’s house. They survived the storm without injury, but it destroyed their source of income. After the storm had subsided, Ayron’s family brought him to Guiuan to have his leg checked by one of MSF’s doctors, who are providing free medical care in the tented hospital in Guiuan, as well as in a number of rural health centres in the surrounding area. Ayron was admitted to hospital immediately. “The doctor said that he would have to undergo surgery, but that there is no need for an amputation,” says Ruby. Three weeks later, after receiving supplementary therapeutic food to build up his strength, Ayron went into surgery. Medical staff working in MSF’s inflatable operating theatre are filling the gap left by the destruction of the district hospital which, until the typhoon struck, was the only health facility in the region to offer surgical treatment. The operation is a success. 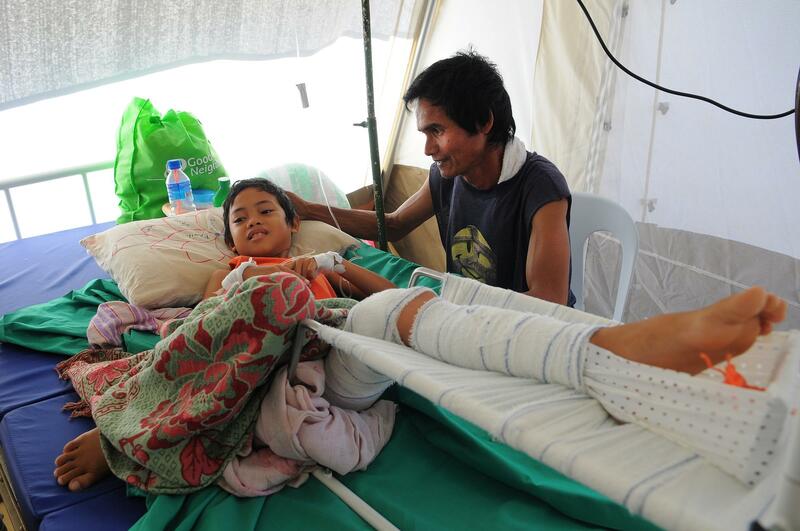 Rowena Evangelista, a Filipino surgeon working with the MSF team in Guiuan, says Ayron has a good chance of recovery and will probably be able to walk again – but it will take time. “He will have to stay with us in hospital for at least six weeks to recover ,” says Dr Evangelista. “He will need to take antibiotics and we will give him more therapeutic food to keep him strong. Finally, the patient will have to learn to walk again.” According to Dr Evangelista, this is not going to be easy. “He will need special shoes, as his left leg is some centimetres longer than his right leg,” she says. MSF is providing medical and humanitarian assistance in five of the most affected areas in the Philippines, spanning three islands. MSF supports hospitals in Tacloban and Burauen (on Leyte island), Balasan (on Panay island) and Guiuan (on Samar island) with the aim of helping to restore normal medical services as quickly as possible.